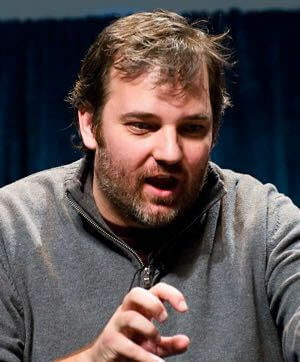 Writer Dan Harmon, the creator of TV’s Community, has a reputation for being a story structure evangelist. For over a decade, he’s been known to ‘break’ the stories he’s working on with a system he known as ‘The Embryo,’ ‘The Dan Harmon Story Circle,’ or just ‘The Story Circle.’ It’s an approach that many other writers have since adopted, including IT Crowd creator Graham Linehan. 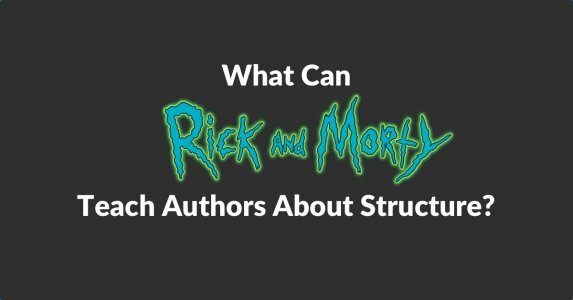 There's perhaps no better example of this system in action than the sci-fi comedy series, Rick and Morty, which Harmon co-created. In little over 30 episodes, Rick and Morty has gained one of the most devoted fan-bases of any animated show since Matt Groening’s Futurama. Known for its fast-paced, pop-culture inflected humor, affection for science fiction tropes (and its not-so-passing resemblance to characters from Back to the Future) the show has also been praised for its dense storytelling, often fitting in a feature film’s worth of plot within a 21-minute runtime. 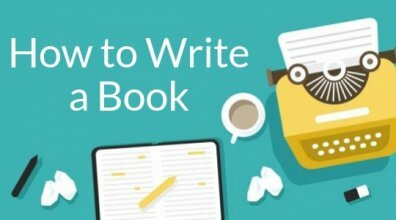 But you might be thinking, this is a blog for authors, not TV comedy writers. Why are they talking about a cartoon with a burping granddad? 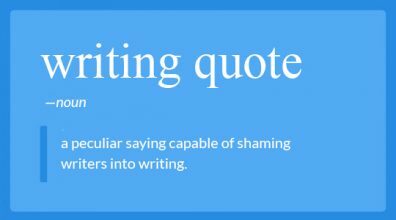 Well, it has to do with something no novelist can avoid: structure. 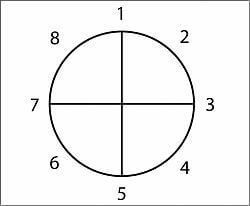 What is the Dan Harmon Story Circle? The benefit of Harmon’s version over Vogler’s is that it focuses more specifically on character and is much easier to apply to a wider range of story. Rick is a mad, drunk, egomaniacal scientist who has invented a portal gun that allows him to have debauched adventures across time and space. He almost always drags his sensitive, anxious grandson Morty along for the ride. In this episode, the also bring along Morty’s father, Jerry, for whom Rick only has disdain. Let's take another look at how the episode’s “A” story — which centers on Morty's journey — fits into the story circle. As Harmon points out, “This is an ethical quandary for Morty.” The boy is put in a situation of guilt that compels him to “go across a threshold and search for a way to undo the ethical damage that he perceives Rick as doing.” That takes us to the next stage. Even though he rarely defies his grandfather’s instructions, Morty takes Rick’s car keys and chases after the assassin, accidentally killing him. Morty discovers an alien gas entity named ‘Fart’ — who was the assassin’s target. Going against Rick’s instructions once more (and making what he believes to be the ethical choice), Morty liberates Fart from space jail. Morty has achieved his goal: he’s saved a life — and can now rest assured that he’s done the right thing. “In the second half of the story, we start finding out that the act of saving that life is going to cost a lot of other people their lives,” Harmon explains, as we see Fart slaughter many space cops while Rick and Morty make their escape. After the escape, the gang returns to a place resembling ‘normal life,’ crossing what Harmon calls “the return threshold.” At this point, Morty realizes that Fart is a truly malevolent creature and means to return with his people to destroy all carbon-based life. 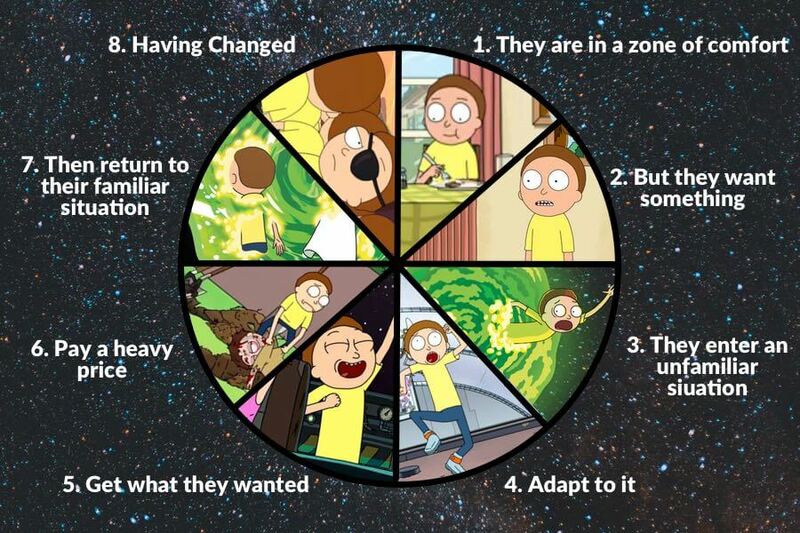 Note: On the circle diagram, Step 7 is directly opposite to Step 3, where Morty crossed the threshold into the unfamiliar situation. Balance and harmony are a big part of storytelling. “So Morty makes the decision to change into someone who kills.” He terminates Fart, thereby saving the universe and becoming someone different from the person he started as. As Harmon points out, this is not a show for kids: not all protagonists need to learn universally positive messages for a story to ring true. Why is this structure a circle? You might be asking why Harmon doesn’t just lay this structure out in a flat line. He lightly touches on the rhythms of biology, psychology, and culture: how we all move cyclically through phases of life and death, conscious and unconscious, order and chaos. The fascinating thing he points out is that cycles like these are, in part, what have allowed humans to evolve. What Harmon's getting at is that stories are a basic, universal part of human culture because of their millennia-long history as both a teaching and a learning tool. This idea of questing, changing, and returning is not a hack concept concocted by lazy writers, but an ingrained part of our collective psyche. That’s why stories from one culture are able to resonate with people across the world. In Harmon’s philosophy, when a book, film, show or song doesn’t meet the criteria above, it’s not necessarily bad writing: it’s simply not a story. 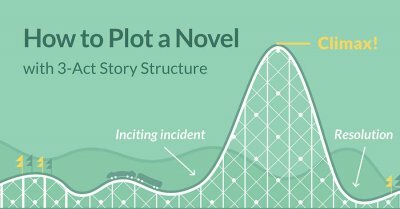 Does the story circle really apply to every story? So let’s put that theory to the test. 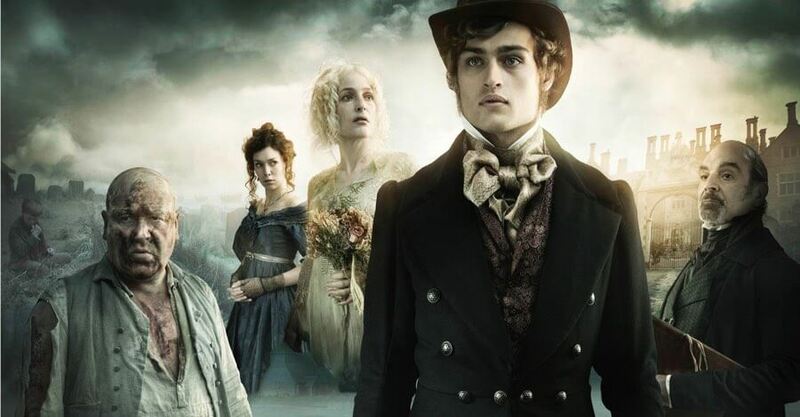 Let’s pick an example that’s the furthest away from a profane cartoon for adults and see if it applies: Dickens’s Great Expectations. Zone of Comfort: Pip, a young orphan, lives a modest life on the moors. But they want something: He becomes obsessed with Estella, a wealthy girl of his age. 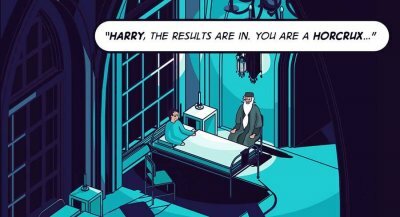 They enter an unfamiliar situation: A mysterious benefactor plucks Pip from obscurity and throws him — a fish out of water — into London society. Get what they wanted: Pip is finally a gentleman, which he believes will entitle him/make him worthy of Estella. Pay a heavy price for it: Pip discovers that his money came from a convict, he drowns in debt, he regrets alienating his Uncle, he realizes that his pursuit of Estella is futile. Changed: Back once again where the story started, a now-humbled Pip reunites with Estella who, due to some plot, is ready to open her heart to him. Although Great Expectation was a serial, written week-by-week, Dickens must have consciously or unconsciously been aware of this cycle. He sent his characters on a journey towards something they wanted — only for them to pay the price and return home, changed. 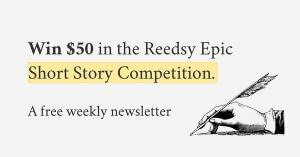 As with any sensible advice about structure, the takeaway here is not that you must slavishly adhere to a set formula or risk ruining your story. 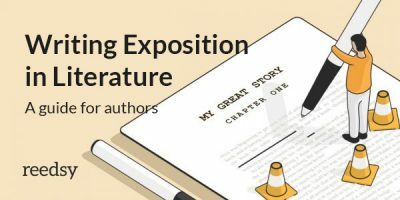 This story circle, along with other popular story structures like the three-act structure, are simply tools based on observations of stories that have managed to resonate with readers over the centuries. 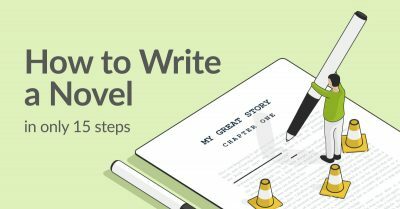 Just know this: if you find yourself at an impasse with any story you’re writing — you could do a lot worse than to crack out the story wheel, identify where you are, and see what comes next in the cycle. What other novels could you break down using the Dan Harmon Story Circle? Take your favorite book and tell us what all 8 plot points are in the comments below. This is great. 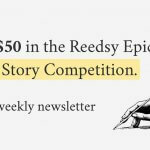 One difficulty about using the Hero's Journey and other Plot Structures is that the main character needs to end up in a different place than at the beginning. That is fine for a movie or a stand-alone book, book but what about episodic series such as Perry Mason, Poirot, or just about any TV series. The Story Circle solves this problem by bringing the MC (actually the entire cast) back to the beginning waiting for the next case, next mission, next customer to enter the bar etc. Even if the series has a long arc (Breaking Bad) over time we see Walter slowly evolving due to the impact of each episode. The location does not need to differ, the change here explained was to the character themselves. After all with the given example, Morty usually always ends up back home. Whether they realised some truth, became more humble, or worse; On that note: If the character is worse off that could be fixed in a future story or you could have a really great villain on your hands to play with! Regardless, change could be anything I think or to someone else. Sorry I didn't mean a different location but a different psychological place. Scrooge woke up in his bedroom but he was a different person on his return.